Kate McCann marked the 14th day of the search for her missing daughter Madeleine by attending a church service Thursday, while Portuguese police released a local Russian computer expert questioned in connection with the case. Kate McCann went to a beach-side church with friends shortly after dropping off her two other children at a hotel kindergarten with her husband Gerry, who was not at the service. 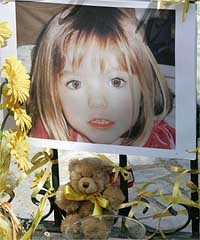 Madeleine, aged 4, vanished after her parents left her, and her brother and sister, both aged 2, alone in their room while they went to a tapas bar inside their hotel complex in southern Portugal's Algarve region, a popular European tourist destination. Police said they questioned a Russian man who is believed to have had business dealings with their only formal suspect in the case, 33-year-old Robert Murat, a British man who lives close to the McCanns' hotel. The Russian, who has lived in the resort town Praia da Luz for several years, was taken to a local police station by plain-clothes detectives late Wednesday. They also took computer equipment from his apartment. Inspector Olegario de Sousa told Portugal's news agency Lusa the man was released in the early hours of Thursday after providing a witness statement. Police have placed Murat under formal investigation, though they released him after questioning earlier this weeke because they did not have enough evidence to charge him. Murat has denied any involvement in Madeleine's disappearance. However, he is barred from giving a detailed public rebuttal by Portugal's secrecy laws, which forbid the release of information pertaining to an ongoing police investigation. A man who said he was a friend of Murat's distributed leaflets Thursday among reporters gathered outside the suspect's house. The leaflets explained the legal constraints on Murat. The friend, Tuck Price, said Murat was upset that media have distributed his name and photograph. "He's upset...he's devastated by this," Price told reporters. "He just wants to switch the focus to the little girl."